The agenda has been announced for the North Beacon Hill Council December meeting, which will be held next Tuesday, December 6, at 7 p.m. in the Beacon Hill Library community room. All are welcome. You are part of the council when you attend your first meeting, and you have voting privileges when you attend your second. The Neighborhood Service Center in the Library is closing -- but could it continue to be a neighborhood resource? Photo by go-team in the Beacon Hill Blog photo pool on Flickr. As part of budget cuts within the Department of Neighborhoods, North Beacon Hill is losing our Community Service Center in the Beacon Hill Library. 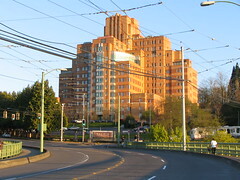 Steve Louie is moving to the Delridge Neighborhood Service Center. He will work in coordination with three other District Coordinators to serve the Southeast, Greater Duwamish, Delridge, and Southwest Districts as a team. The North Beacon Hill Neighborhood Council voted unanimously last Wednesday to request that the recently vacated office become a volunteer-run information sharing space. The location is accessible, highly visible, and already identified as a gathering/information space in the community. A community audit showed strong interest in maintaining a space for information sharing, meetings, assistance with grant applications, and general liaisons between neighbors and city programs. The space would be shared with staff from City agencies such as the Department of Neighborhoods, Department of Planning and Development, etc. Volunteers from a variety of community organizations (including the NBHC, Beacon Arts, Beacon Merchants Association, and others) would staff the space. Please contact the Mayor’s office and city council members to support the idea of maintaining a publicly accessible space to share information and stay connected with what’s happening in Beacon Hill and the rest of the city. You can write, call, email, tweet, or post on facebook. Our elected officials are accessible—access them and let them know that Beacon Hill wants to use this space! 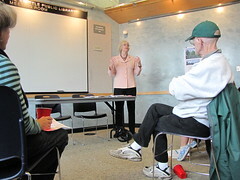 City Councilmember Sally Bagshaw spoke at a North Beacon Hill Council meeting earlier this year at the Beacon Hill Library. Closure of the Neighborhood Service Center will not only remove the services provided by the center, but also prevent the NBHC from holding its meetings at the library site. Photo by Wendi. The North Beacon Hill Council sent a letter today to all members of the Seattle City Council, protesting the planned closure of the Neighborhood Service Center located at the Beacon Hill Library, 2821 Beacon Avenue South. 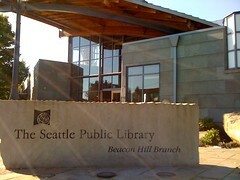 Additionally, Louie’s access to the building allows the North Beacon Hill Council to use the space for council meetings even though the meetings usually need to run later than the library’s normal closing time. If the Neighborhood Service Center is closed, neighbors on North Beacon Hill seeking equivalent city services would need to go to the Southeast Neighborhood Service Center instead, located 3.5 miles away on South Othello Street. North Beacon Hill Council Chair Judith Edwards says, “The loss of our District Neighborhood Coordinator and Neighborhood Service Center would have a tremendous negative affect on all of us. Please contact the City Council.” You can find contact information for all Council members here. The council will vote on the new budget next Monday, November 22. Here is the letter sent by the North Beacon Hill Council to the Seattle City Council today. Judith suggests that people use this as a starting point for their own letters to the Council. This is a final plea from all 150 members of the North Beacon Hill Council (NBHC) and its Board of Directors. We ask that you leave the Beacon Hill Neighborhood Service Center open to the public which it serves in our diverse, but active, neighborhood, and retain the services of our Neighborhood Coordinator. If the Neighborhood Service Center no longer exists in the Beacon Hill Library, an average of 3-5 citizens per day will have no one to turn to with questions regarding the City and other neighborhood problems. Many of these citizens speak English as a second language, use bus transportation or walk, and find the Service Center to be very accessible when they come into the Library for other services, such as classes, computer use, etc. Since diversity and reaching out to under-represented populations is a high priority for the City, closure of this Neighborhood Service Center will be a great injustice to one of the most diverse neighborhoods in the city, and will diminish greatly the City’s outreach to under-represented populations. Our District Coordinators have helped many members of the North Beacon Hill Council to apply for and receive many Small Sparks and Neighborhood Matching Fund grants. Without this guidance, I suspect that the applications for these grants will diminish in number. Stairwells have been cleaned of drugs and prostitution; cross walks have been made safe; parks have been restored—all thanks to the guidance of our Neighborhood Coordinators. The North Beacon Hill Council will be without a meeting place if the Neighborhood Service Center is closed. As many as fifty (50) concerned citizens and citizen activists regularly attend these meetings. We are able to use the Beacon Hill Library Community Room for meetings which end at 9:00PM only because our Neighborhood District Coordinator is housed in the Library and has authorization to lock up after hours. We, the Board and members of the North Beacon Hill Council, ask that you give strong consideration to keeping the Neighborhood Service Center and Neighborhood Coordinator in the Beacon Hill Library, where a very strong community need is now being met. Add more greenery to your life with a free tree. Photo by Wendi. 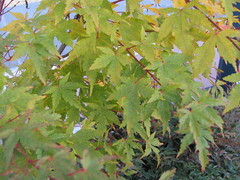 Community members can get free trees for their neighborhood through the Tree Fund, a program of the Seattle Department of Neighborhoods. It is an easy way for residents to beautify their neighborhood and help the environment, while connecting with their neighbors. Groups of neighbors from at least five households living on a street or block can request from ten to 40 trees per project. In addition, each participating household can have a fruit tree for their own yard. Information on how to organize your neighborhood, the selections of trees, and the application form, can be foundhere. The deadline for applications is August 16. This is the 15th year that the Department of Neighborhoods is providing free trees through the Tree Fund program. Through the Fund, Seattle residents have planted more than 20,000 trees, and helped to add to the city’s dwindling tree cover. In 1972, Seattle had a tree cover of 40 percent. Now, that cover has dropped to 22 percent. This decline threatens nature’s ability to help manage storm water, reduce erosion, absorb climate-disrupting gases, improve public health and clean the air. The goal of the Tree Fund program is to increase the percentage back to 30 percent, build community, and promote a clean and green environment for Seattle’s streets. For questions or additional information, contact Judy Brown, Seattle Department of Neighborhoods, at 206-684-0714. In addition, Seattle reLeaf is providing free trees for residents who live in specific neighborhoods within southwest and southeast Seattle through the City’s 2010 Trees for Neighborhoods program. To learn more, visit the website.